The misty rain collected and tested in the video rolled in from Santa Monica Bay in a turbulent marine layer the morning of March 31. This wasn’t a typical rain. 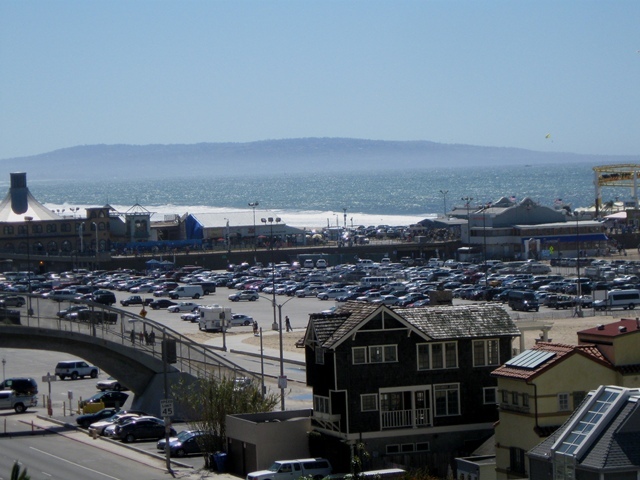 High waves and strong winds in the bay had generated enough sea spray to contribute to a dense cloud bank which rolled in over the western coast of the Los Angeles Basin. The rain, if it was that, seemed unusual in that it was like the Westside’s famous “June Gloom” only too early for the season and it raindrops small in diameter. This precipitation was also unusual in that it was the most radioactive rain sample EnviroReporter.com has yet detected in Southern California. A subsequent storm, in the evening had substantially less radiation in it as it had come in on a front versus form over the churning Pacific. The higher altitude rain was colder with larger raindrops suggesting that the two precipitation events, while related, were not comprised from the same water source. One misty rain sample collected in downtown Santa Monica was over five times normal background radiation, the highest level in Los Angeles Basin rain since this reporter began sampling and testing different media March 15, 2011, four days after the Fukushima Daiichi meltdowns began. Even after conducting over 1,500 radiation tests, it was still shocking to detect rain readings so hot as to qualify for California Highway Patrol hazardous materials protocol. But it wasn’t surprising. The weather conditions were perfect for radioactive “buckyballs” and other Fukushima fission products in Pacific waters to suffuse the air and moisture and rain down on unsuspecting Southern Californians. Few of these people know that radiation-impacted sea spray can spread hundreds of miles inland bearing radionuclides like the ones unleashed at Fukushima Japan over a year ago beginning March 11, 2011. 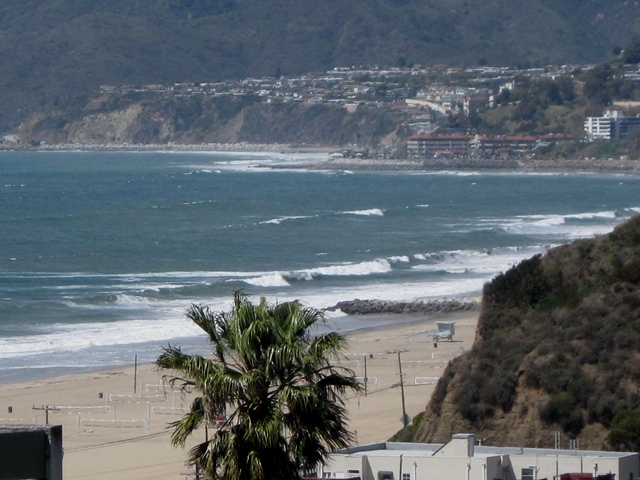 Like an unwanted April Fools joke, the cooling sea breeze in Southern California could be carrying contamination borne in ocean waters well in advance of the main sea of cesium, strontium, uranium and plutonium that covers an area the size of California drifting eastward from Japan towards North America. That mass will impact California directly in 2013 heralding The Endless Bummer. 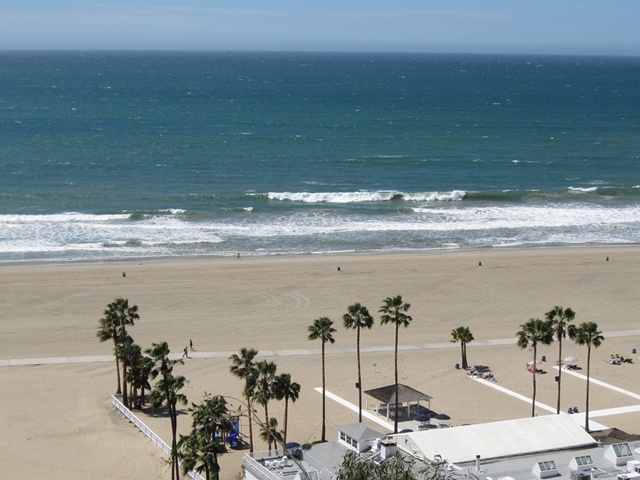 The National Weather Service announced the imperfect storm March 31 a couple of hours after this reporter sampled the Santa Monica marine layer precipitation and found it to be markedly hot. It seemed unusual in that the conditions the NWS described seemed to have arrived long before the warning were given. It wasn’t unusual that the service doesn’t inform Americans of the radiation in their rain. In fact, as our coverage has shown over the last year, the American government basically considers the triple meltdowns – with seven additional reactors worth of spent fuel rods hanging precariously in a fourth destroyed reactor building – a non-event. Regardless, the weather conditions seemed perfect to see how accurate EnviroReporter.com‘s investigation had been in determining how buckyballs and Fukushima radiation was impacting Southern California. It turns out that they seem dead on. 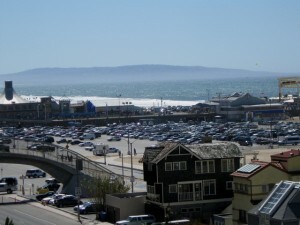 The nature of the land where the Santa Monica sprinkle sample was taken indicated no “natural” radon progeny which could give a false reading of high radiation from the meltdowns. Indeed, this marine-layer rain was blowing in straight off the bay negating the possibility of radon gas impact. What we detected back at Radiation Station was goo. The video evidences how the Inspector Alert nuclear radiation monitor detected heightened ionization very close to the rain sample – less than half an inch. This is indicative of alpha radiation, 60 to 1,000 times worse than beta or gamma radiation. This was goo made airborne in the restive seas and violent gusts and mixing with the ocean rains that lasted for less than an hour. The weather service said that coastal areas across Southern California could see southwest winds of 25 to 35 miles per hour with gusts up to 50 mph by late afternoon and evening. The wild winds were courtesy of a storm that had swept southward out of the Gulf of Alaska pummeling the West Coast north of us with possibly even hotter sea spray since it is further up-current related to the source of the contamination over 5,000 miles away, Japan. A day earlier NWS had issued a high surf advisory for San Francisco, southern Monterey Bay and Big Sur. The weather was so bad that a 67-foot yacht, the Clipper Venture 6, was slammed by a massive wave injuring three of the 13 people on board 400 miles off the California coast. A weather service buoy 500 miles off of Eureka in Humboldt County recorded winds over 50 mph in 30 foot seas. This kind of massive agitation of an ocean creates huge amounts of sea spray which can coalesce into rain. It is possible that across the Pacific, this kind of agitation of contaminated sea water has helped push the radioactive water now turned into rain, farther east than the main current on the prevailing westerly winds. This can be the reason such high radiation readings in sea-sourced rain have been found months before the main gyre of goo arrives. The increasingly toxic tide hit Ventura Harbor with 14 foot waves while farther out to sea the Channel Islands were pounded by 10 foot swells. 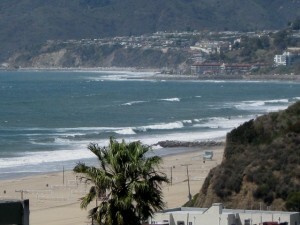 Farther south in Santa Monica Bay, where EnviroReporter.com photographed the turbulent toxic sea spray set loose by the churning chop, 8 foot waves crashed ashore in Hermosa Beach. Further strengthening the scientific mechanism that Fukushima radiation is impacting Southern California via Pacific Ocean sea spray, a brief storm unrelated to the earlier misty rain, swept through the region and was decidedly less radioactive than the earlier sprinkles. The evening rain was just 30% hotter than background radiation, a 15-fold reduction in radionuclides from the precipitation detected by Radiation Station Santa Monica in the morning. “Beta Watch” delineated the unholy confluence between the U.C. Davis study showing that uranium-60 buckyballs, and possibly other radionuclides unleashed from the three destroyed Japanese reactors, created en masse at Fukushima and spewed into the Pacific making its way ashore in North America on sea spray, a form of radionuclide mobilization confirmed in several United Kingdom and European studies. The highest radiation in Los Angeles-area rain yet recorded, in the form of precipitation from a fog bank of moisture riven with radioactive sea spray, strongly suggests that Southern California has been and will get pounded by Fukushima’s increasingly deadly cargo. @babylon system: We have addressed this extensively in Beta Watch. None of our readings are impacted by radon progeny. Read our work before leaping to conclusions. In Beta Watch, you can literally see the proof. I’m 110% anti-nuke, shut them all down, we never should have built them in the first place. However, I have an inspector alert too, and I scared the crap out of myself when I measured rainfall that contained radon progeny. So when you post videos like this you need to specify how long you’ve had the sample before you measure it. My sample went from 200 CPM to normal background in about 3 hours. How long did you have this sample? Do you still have the same sample? If you still have the sample it should still be hot. If it’s not then you were measuring radon progeny. It would be appreciated by your viewers if you would discuss the sampling timing, and or follow ups. So that false-positives from radon progeny are not reported. @Dr.Prokop: We already know this is true. Counterpunch had a statistician crunch numbers in response to criticisms of the Dr. Janette Sherman & Joseph Mangano study methods that looked at significant infant mortality rate increases in the Pacific Northwest immediately following Fukushima. 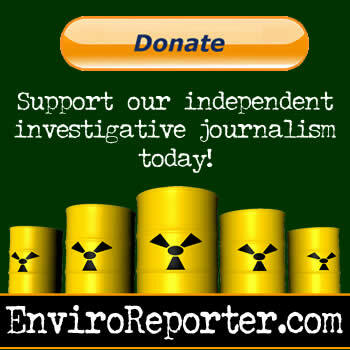 “Sprey [Counterpunch’s statistician] reviewed the data and confirmed that if you accept the sample cities that Sherman and Mangano picked, and also if you accept comparing 4 weeks before the March 11 Fukushima disaster and 10 weeks afterwards, then Sherman and Mangano’s calculations are valid. One of the CounterPunch critics pointed out that using four weeks before and ten weeks afterwards “looked like cherry-picking the data.” To overcome this potential bias, Sprey collated the death numbers for the ten week period before, then did the calculations comparing infant deaths for ten weeks before and ten weeks afterwards for the same eight cities. His result was a statistically insignificant difference in deaths per week before and after? an increase of infant deaths of only 2.4 per cent. To further guard against the possibility of some seasonal effect due to comparing a period earlier in the spring with one later in the spring, Sprey also compared the ten weeks after Fukishima with the identical weeks in 2010. He found exactly the same result: a 2.4 per cent increase in infant deaths over the prior year which, given 128 deaths in the ten week sample, is entirely insignificant statistically. But then Sprey went further and looked at the Sherman/Mangano selection of eight cities from the 122 reporting to CDC: the eight were Berkeley, Portland, Sacramento, San Francisco, San Jose, Santa Cruz, Seattle and Boisie. Apparently, they selected Pacific Coast cities that were more or less within 500 miles of the coast and north of Santa Cruz. However their selection did not include all CDC cities within this categorization, because they left out Tacoma and Spokane, thus leaving themselves open to suspicions of cherry-picking cities. So Sprey included Tacoma and Spokane in the data set he reviewed in order to be geographically complete. When Sherman and Mangano’s overall selection of cities failed to produce a significant result for ten weeks before and ten weeks after March 11, 2011 (as well for the ten equivalent weeks in 2010 as compared with the same weeks in 2011) Sprey elected to look at smaller, geographically consistent groupings of cities. The results were striking. Why don’t you seek out the results for the effects on the foetus and children,the most sensitive guinea-pigs yet found ( no disrespect). Early neonatal deaths (stand in for congenital malformations,which may or may not be collected) and infant mortality would reflect clinically important radiation effects that will only be seen later in adults. Children absorb X100 the amounts of dangerous radionucleotides than do adults…a fact that many wish to gloss over.The extensive importance of potassium (caesium) and calcium (strontium)in depolarisation and contraction of heart muscle and purkinje fibres is important here,let alone the vital co-functions of Iodine in all growth processes. so who do i sue, when i contract skin cancer or thyroid issues?… anyone have iodine pills? Spirited interview discussing April Fool’s weekend rain in Los Angeles coming in at over five times background and how this strongly suggests that the mechanism for Fukushima meltdowns’ radiation mobility in the Pacific is accurate and based on good, sourced science in direct contrast to the American and Canadian governments’ ‘see no goo’ non-policies. Also, San Onofre Nuclear Generating Station’s woes worsen as word that Southern California Edison changed four key parts of the now-shut plant without Nuclear Regulator Commission inspection or approval. I would not want to be living in it north west right now, They have seen high levels of radiation, I hope that no children are affected from the electric plant ‘melting down’.. At this point it seems like nothing can be done, I did tell my sister to test her home and install a radon gas vent system in her home for the fact that it will pump most of the radon out of her home, it is a worthwhile investment! I don’t know who this guy is, but he posts an alarming video like this and disappears. He’s not allowing comments for this video at youtube either. Why not measure in CPM???? I’m a little confused. This was just posted but seems to be referring to the rain sample collected in 3/2011? How is the rain doing now? I was just curious how you’re testing these samples and if you’re holding on to them and re-testing after a few hours (or a day) to see if the levels stay high. We’ve been out in the rain a few times recently up here in SF and naturally, these levels are alarming to say the least. What units are you measuring? how does that compare to rads? Thank you sir. Did radiationnetwork.com show this?? Embrace the horror! The Mayans told you so. It is greatly appreciated. However you have to be more careful handling materials like this. I know it is difficult, and you have little choice – as it is all around you. So, I guess being or playing in the rain is out of the question from now on?